Six months ago today, we made the long trek up the spine of Florida. Past the nearby cities, through the Citrus Groves, into the splat that is the Theme Park ridden area of Orlando, and finally to Deltona. In Deltona we met Gisele and entered her home to adopt Rack. Rack was named Les Paul when he was with The Dog Liberator, he needed a name, and they chose that musical one. It didn't quite fit us, and we were trying to come up with one that did. Since we were recovering from the loss of our Dog Of A Lifetime, Lettie, we settled in on a name that she suggested. When we stood in our large kitchen in Philadelphia shortly after we adopted Lettie back in 2002, I asked Kevin for a little help. I needed a baking rack. When I said that word, Lettie snapped to as if being ordered around. We never found out why, but when it came time to name our boy, it stuck. Like many other, or even most other highly intelligent dogs, those surrendered to a shelter may shut down. Rack was one of the most severely shut down dogs I had ever seen. But like Gisele said "He's in Deltona, He needs you". Our heart strings were pulled, Kevin said "She's good, lets get him!". Lettie was shut down when we got her, but in a much better frame of mind then. She did give us the experience we needed to work with dogs like Rack. In the six months that we've had him, we've watched him grow. He's gone through three different de-worming treatments, and missteps with dog foods that held him back. He's put on another 10 pounds, grew about 4 inches in height, and has a coat so shiny that when you pet him your hand comes back with lanolin. Robust is what we'd call him. Thanks to a suggestion by a neighbor, we got him on Orijen dog food. No Chinese sourced ingredients for this one. I don't want to go through the syringe feeding that I did with Lettie near her end. He's still showing signs of his trauma. Loud sounds are triggers to him and make him turn and try to hide. Twice a day we walk out to Wilton Drive and have a sit down on the benches. At 6AM it's quite quiet, but at 9AM it's an experience. He is getting immersed in the buzz of the city. The 50 bus is bad enough, but in the morning when the trash trucks pick up the bottles from the bars, he notices it even a block away. On the other hand, he's one of the sweetest dogs I've ever met. He's a McNab, a not very well known breed outside of the ranches of California and nearby states. Incredibly intelligent, eager to please, he'll simply do what you ask as long as you don't drop something that makes a noise. A similar breed to the Border Collie, but definitely not one. The BC's are a bit more high strung, my McNab has a mellowness to his personality that you have to experience, but once you do you will understand. There's a sweetness and a subtlety to him that is hard to put to phrase. The ranchers will say the difference between a BC and a McNab is the way they work. Perhaps that is the best way to say it. They're both great breeds, but the McNab is it's own. It's not all sweetness, having a Herding dog means that you absolutely must exercise them. Fortunately he's good with the 4 miles a day that we walk, and everyone in our society could use that. Anything less and you are in for a strange experience. The ranchers and breeders in California can't understand how Their Dogs can live in an Urban Environment, but we are proof that they can adapt and adapt well. Intelligent Dogs aren't for everyone, nor are active dogs. Some people should only have a dog from a toy store filled with polyester fluff - a stuffed animal. I'm doing my best by him and as a result my dog is growing every day. He's still the "Yellow Footed Collie" as he learns how to properly water a rock or a hedge, but that gives me the excuse to work with him more so that he doesn't get fearful. That hose in front of the house gets a workout frequently and will until he grows into a better aim. Once he learns that particular "trick" I may just let him on the furniture. 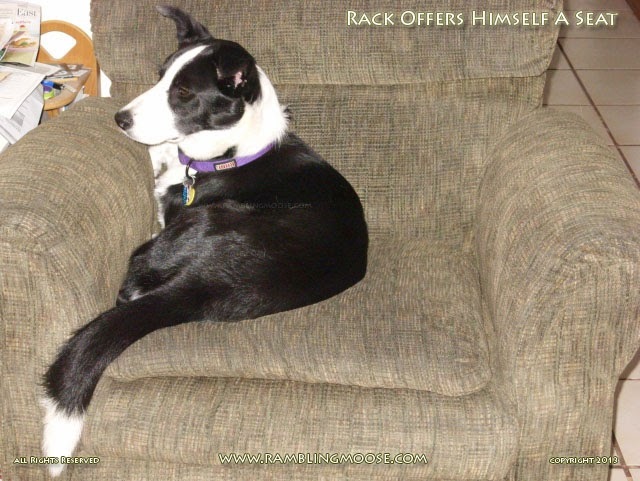 That picture was taken when he invited himself on the chair. First a wet nose on the elbow, then he pulled himself up bit by bit until he was on Kevin's lap. He didn't want to leave the chair when Kevin did so he stayed behind. So six months on my rescue and I are continuing our journey. He rescued me when Lettie left us. Now we can grow together.